– It’s going to be tough with only Mike Bibby and Toney Douglas at the point but that’s no reason to rush Lin back. 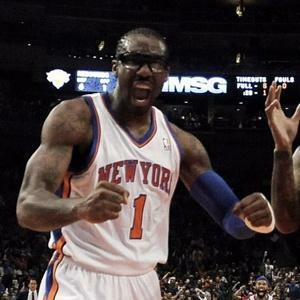 You can’t risk a major injury on the off chance that the Knicks can come back from three down to beat the Heat. – The refs once again called a horrible game. If Queen James is driving down the lane and shoves Landry Fields as he’s making his move, it should an offensive foul. You can’t push somebody with your off hand if they get in your way. – Again, I never thought the record was a huge deal but it felt great getting the win out of the way so there’s no need to think about it ever again. Now we can just worry about playing hard. If the Knicks had lost Game 4, I would have said the season was a failure, but now there’s a (very small) foundation of positivity that can be built on. Little by little, the Knicks’ stigma of losing and the stink of Isiah Thomas is going away, and it’s going to be easier to attract talent and eventually contend for a Title. Right now, I’m just a happy fan.